DermaLash Reviews | Does DermaLash Work? The world of eyelash growth enhancing products can be a confusing place for consumers who are looking for ways to maximize their natural eyelashes. There's no shortage of products that claim to help you grow thick, dark lashes, but which of these products can you actually trust to come through for you? 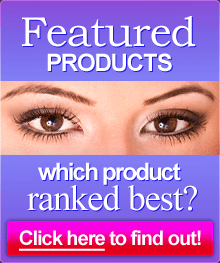 We have taken the guesswork out of this process with our in-depth evaluations of the top eyelash products. Made by DermaQuest Skin Therapy Inc., DermaLash promises noticeable results within six weeks of regular usage. What makes DermaLash unique is that instead of formulating another eyelash growth product to use at bedtime, DermaQuest instead created DermaLash formulations in four colors -- black, cocoa, indigo, and plum -- to also be used as a conditioning eyeliner product. DermaLash is applied just like regular eyeliner to the upper and lower lash line, so it performs double duty as a colored eyeliner and a lash treatment at the same time. Judging from the reviews of DermaLash, the product can help lashes to grow fuller and longer, but the growth rate seems to be slower in comparison with other eyelash growth enhancers. This may be due to the pigments that are added to DermaLash so that it can function as an eyeliner, or it may be because the product is applied during the day as a cosmetic rather than at night to work when the body's cells are most active in their repair and growth stages. DermaLash users either mostly liked the product because it eliminated having to apply eyeliner in the morning and a separate lash product in the evening, or they seemed to find it ineffective and gave up on it after several weeks. The manufacturer notes that it could take as long as six weeks to see any effect from the use of DermaLash, so users may be giving up too soon. It's hard to stick with an eyelash enhancing product for a long time though, as some competitive products can produce measurable results in as little as two weeks of regular use. While the official DermaLash site does not disclose all of the product's ingredients, we were able to piece together some components of the formula. The major ingredients found in DermaLash's formula include Peptide complex, soy and wheat protein, anageline, and biotin. It's not clear if DermaLash contains substances that can permanently change the color of the skin around the eye or of the iris, and it's also unclear whether the product contains parabens. The good news about DermaLash is that there don't seem to be many harmful side effects associated with this product. A few users complained of minor irritation, redness, and itching, but these symptoms were quickly resolved when product use was discontinued. While we love the idea of combining two products -- eyeliner and eyelash growth enhancers -- the reality seems to be that something gets lost in the reality. In comparison to similar eyelash growth products, DermaLash just doesn't seem to be as proficient in helping to coax length and fullness from natural eyelashes. For a more effective choice that promotes faster and more effective growth of the natural eyelashes, read our review of MarveLash.